This recipe makes a glogg syrup which is later added to wine to make the classic Scandinavian winter drink. In a large pot, simmer the first ingredients for about ½ hour. Add the sugar and grape juice concentrate and continue cooking until slightly syrupy. Strain the syrup into a container and let cool. Retrieve the raisins from the strainer and save for serving. Serve the hot glogg in small (espresso-sized) cups to which you will add a whole almond and a few of the reserved raisins. 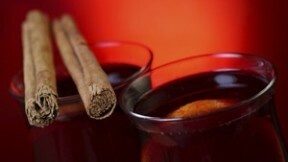 For non-alcoholic glogg, use non-alcoholic red wine. For children, heat the syrup with ginger ale, apple juice or white grape juice.